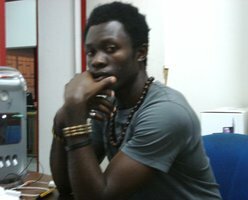 A graphic designer and illustrator living in Douala-Cameroon. Actually working at the Advertising Agency Ogilvy-Cameroon, I'm addicted to art . I have studied TV Program Direction and Photography at a graduated university for two years. I have a great ability on drawing and i'm full of creativity. My next goal is to run about 2D and 3D animation to improve all my creativity.